The volume of online content being produced every day now is growing exponentially, making it harder and harder for people to find you (and even remember you). Clickbait articles are everywhere (even Facebook is starting to fight against it). Aggressive popups annoy people and Google will penalise you if you keep using them. The battle against email spam never ends. As a result of this aggressive marketing, ad blockers are getting more and more popular. That’s because people are getting sick of annoying ads. The internet once felt like a peaceful library of quality content, but now it’s starting to feel like a landfill of advertising trash. Marketers have a terrible reputation. 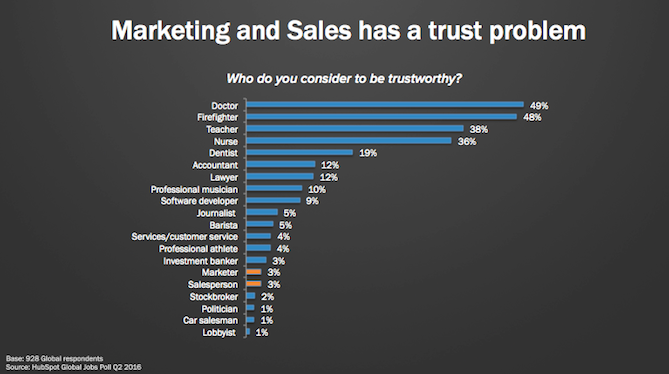 In fact, only 3% of the general public trust us. Marketing in general, has, for many people, become synonymous with interrupting, tricking, lying, manipulation and inescapable annoyance. We spend so much time competing with other companies for customer attention that our products and services suffer. We prefer to hide behind buzzwords than speak directly and plainly. In the process, we’ve lost touch with people. Bad marketing damages brands. When we trade loyal customers for short-term gains, we lose their trust. Many businesses only focus on meeting their next quarter target. They see employees as resources and customers as cash generators. When customer focus is lost, the bottom line will eventually suffer. 31 of 34 directors from big companies (Fortune 200 boards) would cut down a forest to get more money. Yet, investors got less bang for their bucks in the last 40 years than they did 80 years ago. Let’s face it: Profits Before People isn’t working. We agree with you, Jack. Between the pressures of meeting quarter targets, continual sales growth and market competition, a crisis emerges. The internet becomes more and more polluted. People get annoyed and become immune to bad marketing. They stop trusting your business and prefer personal recommendations. Your competitors get better and better. You lose your most loyal customers. The pressure is on to meet the next target. …and the cycle of crisis starts all over again. This crisis constantly advances regardless of popular methodologies like Conversion Rate Optimization (CRO), Inbound Marketing or Content Marketing. We were sick and tired of internet pollution, marketing garbage and shareholder tyranny, so we started Slices Consulting to cut through the BS. We help businesses get more conversions and long-term profits with a no-BS, respectful & structured approach to Internet marketing. We call it Good Marketing. Our approach is at the intersection of many disciplines: marketing, psychology, economics, ecology, social responsibility and design. Thinking you know best. Talking and listening to people. Using employees as resources. Treating employees with respect. Focusing on short-term gains. Trust is the currency. Slow to change. Adapting quickly. Launching big, slow projects every four years. Continuous small, iterative improvements. Interrupting people online. Respecting people’s choices. Polluting the Internet. Maintaining a clean and enjoyable online experience. Tricks, deceptive and manipulative techniques. Being honest, even when nobody’s watching. Copying the competition. Following your inner purpose. Stalking people online. Respecting people’s privacy while providing value. Focusing on tools and trends. Focusing on strategy and process. Being corporate, showing no emotions. Being human and real. Trust: Currency of relationships. Customers will trust businesses that offer value while communicating openly. Authenticity (No BS): Don’t manipulate or deceive people to get them to do what you want. Care/respect: Treat people how you want to be treated. Openness: Share the good and the bad. Honesty: Do the right thing, even when no one is watching. People: We believe that people will naturally respond to enjoyable online experiences. Rather than focusing on shareholders or profit-at-all-costs, growing organically and sustainably means focusing on who your customers. You’ll be able to understand their pains, needs and wants. We believe that employees are also critical assets to the business. As brand ambassadors of the company, their actions affect your reputation. It’s just as important to treat tyour employees with respect and authenticity, and train them to listen to people, too. Culture: Instill a theme of unique purpose and inspire your customers with your story. Evolve: Standing still kills. A new website every 3 years is not the solution. Businesses need to move fast based on real data and insights and test everything along the way. We don’t look only at “websites”, but use data to identify real problems and solve them – and that could mean something as specific as a landing page, form, call-to-action, or something as foundational as a better CMS or CRM tool. © 2019 Slices Consulting. All rights reserved.